XXL Nutrition Omega-3 is a high-quality supplement in the form of easy-to-use softgels containing fatty acids of the omega-3 family. They are known for their versatility in supporting the human body: they reduce inflammation and support the circulatory and nervous systems. Scientists noticed a long time ago that communities whose diet includes a lot of fish were statistically less prone to diseases connected with circulation, such as heart attacks and strokes. Further research has shown that it might be caused by higher omega-3 consumption. Since then, omega-3 acids have been associated with many positive effects on the heart. One of their abilities is reducing blood triglyceride levels by as much as 15-30%. Apart from that, they help to reduce blood pressure in people struggling with hypertension. They can also prevent the formation of clots in arteries and help to maintain the right structure of their walls. It is an important element of arterial embolism prevention. Depression is one of the most well-known mental disorders of the current era. Its symptoms are sadness, anhedonia, apathy, and a general lack of interest in people and everyday pleasures in general. Research has shown that people who regularly consume omega-3 acids carry a smaller risk of developing depression. What is more, in the case of people who are already suffering from depression, supplementation with omega-3 acids for some time can reduce its symptoms. When it comes to depression, the acid that proves the most helpful is EPA (eicosapentaenoic acid), which, according to a study, turned out to be just as efficient as Prozac. DHA (docosagexaenoic acid), one of the omega-3 acids present in this product, is a crucial structural element present in the brain and the retina of the eye. Its deficiency can lead to problems with vision. Interestingly, a proper amount of omega-3 acids in diet is correlated with a reduced risk of macular degeneration, which is one of the reasons behind permanent vision impairment and blindness. Inflammation is an incredibly important defence mechanism that allows the human body to combat an infection and repair the damage induced by the sickness. However, inflammation often does not recede right away, turning into a chronic process and that way contributing to the development of many chronic conditions, including heart diseases and cancer. Omega-3 acids can help to reduce the synthesis of compounds and substances connected with inflammation. The substances are, among other compounds, pro-inflammatory eicosanoids and cytokines. Research clearly shows that there is a connection between high omega-3 consumption and inflammation reduction. ADHD is a disorder that manifests itself by a short attention span, hyperactivity, and impulsiveness. Several studies have demonstrated that children suffering from the disorder have lower omega-3 levels than their peers. What is more, many experiments show that supplements containing omega-3 acids can help to reduce the symptoms of ADHD. They can help the young ones to focus better and finish a started task. Pain during menstruation occurs in the lower abdomen and pelvis and can even radiate to thighs and lower back. It often leads to lower productivity and has a negative effect on the quality of life. Scientists have proven that women who consume proper amounts of omega-3 experience menstrual pain much less acutely. A study showed that a supplement containing omega-3 acids proved more efficient in treating acute menstrual pain than Ibuprofen. 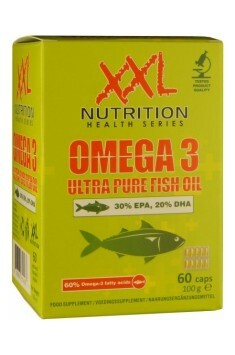 To sum up, XXL Nutrition Omega-3 is a top-quality supplement with versatile health-promoting action. Omega-3 acids contained in it are an important element of heart disease prevention and help to improve the lipid profile. Moreover, they have a positive effect on vision, and can aid ADHD therapy in children. Apart from that, omega-3 acids can support the fight against depression and help to reduce acute menstrual pain. 1-2 capsules a day, during or after a meal. Omega-3 acids can prove helpful in the treatment of rheumatoid arthritis. Supplements containing EPA and DHA can reduce joint pain and stiffness. Besides that, they seem to reinforce the action of anti-inflammatory drugs. Supplementation with omega-3 is worth considering particularly by pregnant women. DHA is important for the development of the eyes and the nervous system of infants. The consumption of fish oils and omega-3 supplements can be risky for some people, such as those using anticoagulant drugs, whose activity can be increased by omega-3 acids.